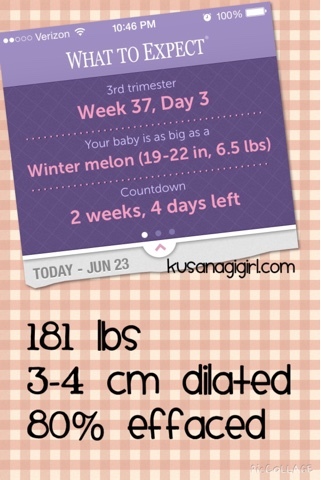 KusanagiGirl: It's really any day now! First order of business, I have decided on a name for Baby #2! From here on out, she will be known as Gummybear! So I went in for my routine visit with my ob/gyn and while I'm still more than 2 weeks away from my official due date, today's exam really surprised me. Gummybear's head is totally engaged in my pelvis and cervix. I'm, as you can see, 80% effaced and 3-4 cm dilated. This time last time with Jellybean I had already been in pretty painful labor for 10-12 hours getting from 2 to 4 cm. So I'm grateful that it hasn't been painful getting to this point with Gummybear. But it makes me wonder when will I go into labor? I've been searching forums and reading up on when I might expect to go into labor being this far along and all the results are the same. I could give birth tonight or in another one to two weeks. Not very helpful. It makes me a little sad too, that pretty soon we won't be able to devote 100% of our energy and attention to Jellybean, who is hitting language milestones right now. But on the other hand it makes me pretty happy that Jellybean is going to be a big sister. She and Gummybear are going to be lifelong friends and I really do hope that they cultivate a relationship that is just as strong, if not stronger, than the relationship they each have with their parents. I cannot imagine a Jellybean without a Gummybear and vice versa. Are we ready for this?!?! It's too late to back out now!!! But seriously though, we recognize that some things are going to be like an old hat. We'll just know what to do and have experience getting the tasks done. But other things will be uncharted waters for us. I think we're just worried about family life dynamics and how to navigate that with authority so that the children don't see us falter. And lastly, yes, 181 lbs. I am definitely carrying a lot of weight on my feet. I already have my workout plan on Pinterest and will start on it after I give myself a break and relax after the delivery. Wow! I'm bouncing off the walls with excitement! It's any day now!! Yay! !